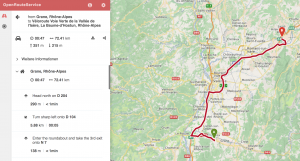 We would like to introduce you to a brand new API of OpenRouteService.org and a revamped route planner with many more features than before. With this major release we have removed XML and introduced a (much) longed for JSON support. You will notice some drastic optimisation in response times and you now have the advantage of using GET requests which makes your design of requests quite a way easier. We have increased the stability and scalability of the API to prevent tedious downtimes. Furthermore you now have the possibility to sign up for the API and receive your key - automatically to your inbox. In terms of features we have introduced a brand new isochrones endpoint which allows time or distance metrics and is even able to compute multiple locations at once. You will also be able to give our new hiking profile a buzz and even use reverse directions for isochrones which consider topography and special attributes of streets such as one way streets. All of this comes in a new look with an improved user experience. We have added an easier share functionality of routes and shorter permalinks. You will be able to down- and upload more formats (gpx, tcx, kml and geojson) than before and even export computed isochrones as geojson files. 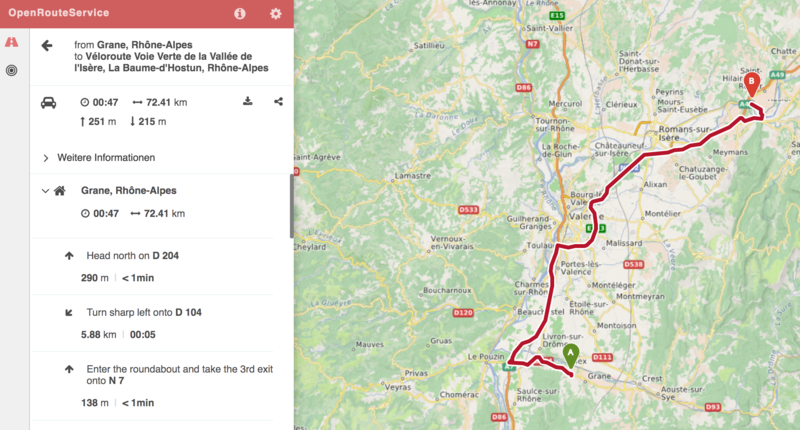 We revamped the route instructions list with toggle functions to keep the list neat and clear for your needs. Please contact us for feature ideas, improvements or bugs and enjoy consuming the new OpenRouteService API. By the way, you will be able to find the old OpenRouteService.org website here (including wheelchair routing that will be improved for the next update on the main instance) and you will be able to consume the deprecated API serving XML until the end of May. Stay tuned for further updates! Support for more languages soon to come. Contact us if you have specific requirements. This work has kindly been supported by the Klaus Tschira Foundation, Heidelberg though the core-funding for HeiGIT (Heidelberg Institute for Geoinformation Technology).